Sometimes it’s hard for kids to just be kids! They’re involved in countless activities and have pressure to accomplish a lot of work and testing at school. It’s important for parents to be involved and aware of how their kids are feeling about school and to be able to diffuse stress and anxiety before it becomes a problem. One way to help your kids is to help them establish good sleep habits. Overtired children (and adults!) are more easily overwhelmed and less able to focus. 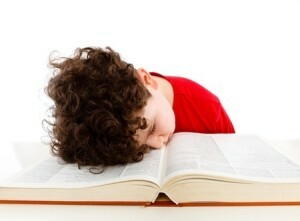 Every child is different, but many recommend as many as 12 hours of sleep a night for young school children. That number decreases as they get older, but anything under eight hours can lead to sleep deprivation. Try to simplify the schedule of your family. This can be a tough one! With so many activities and schedules, it’s often difficult to get everyone together at once for dinner, let alone an entire evening. But, in the interest of your kids’ mental health, attempt to give kids down time after school so they can recharge and spend time on imaginative play and unstructured creativity. Focus on fitness! Physical activity is a great stress reliever. Walking to and from school, if possible, or hitting the trails on the weekend will give kids much needed fresh air and exercise. Fitness also includes balanced meals. Avoid too much processed food or artificial ingredients. Getting proper nutrients will help keep kids healthy and better able to ward off illness. Sick days can ultimately lead to more stress with missed lessons and make up work! Reduce screen time, especially on school nights. Kids tend to sleep better when not overstimulated by technology, and they can replace weeknight screen time with much-needed sleep minutes! Be realistic though, if your kids are teenagers and have unrestricted device access now, cutting it off all at once may be hard to enforce. If they’re stressed though, and they can see first-hand how limiting screen time helps them, they’ll get on board quickly. Teach kids relaxation techniques. Meditation, deep breathing and more strategies can help children work through those trying moments and be able to tackle challenges with a clear head. If your child continues to struggle with anxiety at school, be sure to talk with their teachers or school counselor to see how you can work as a team to help them cope. It’s wonderful to have high expectations and encourage our kids to do their best, but ultimately they should be having fun and enjoying the freedom of childhood!